Pipe Test Plugs Must Be Braced While in Use. 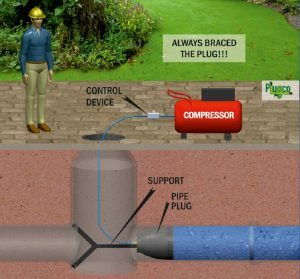 Pipe Plugs Stay Clear While the Plug Under Pressure! Read Safety Manual before use the plugs. Plugs Must Be Braced While in Use!!! Stay Clear While the Plug Under Pressure!!! The End User must read and understand this PlugCo Safety Manual before using the plug. The failure of a plug for any reason including improper maintenance, installation or use can result in bodily injury, death and/or property damage! [1.1]Read and understand this PlugCo Safety Instruction Manual before using the plug. Use the plug only as shown in the PlugCo User Manual which must also be read and understood by the user. CAUTION!!! 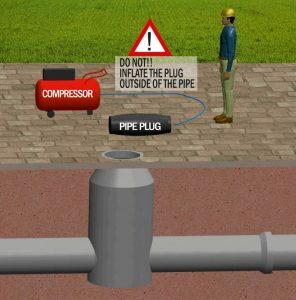 The pipe plugs should be used by a trained and experienced team. 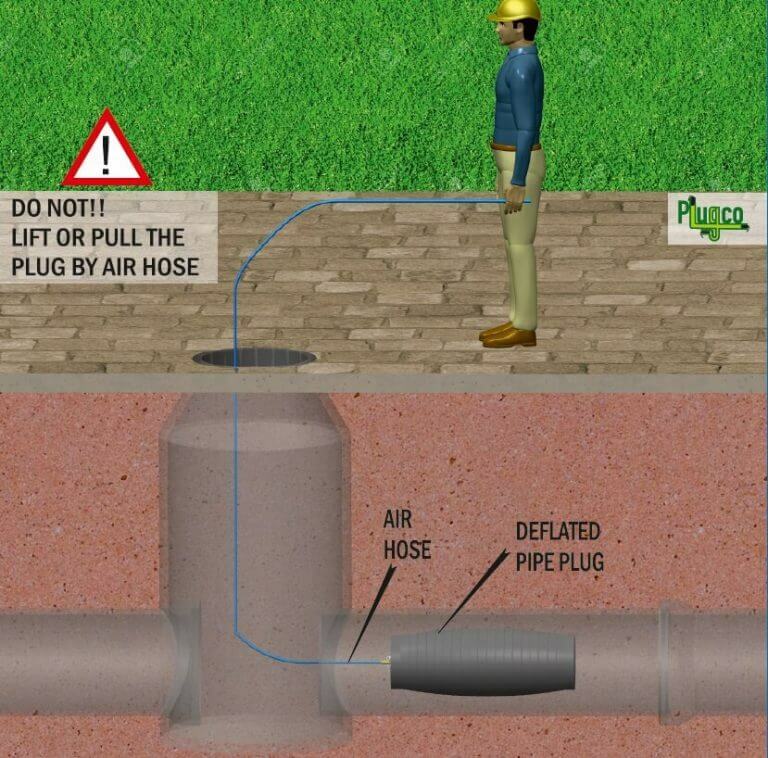 If your team has not been trained in the proper use, care and application of pipe plugs, DO NOT USE PlugCo Plugs. Usage by an untrained team may cause death or serious injuries. PlugCo can provide training and supervision for your team. [1.2]Applying and following proper safety measures are the responsibility of the end-user. 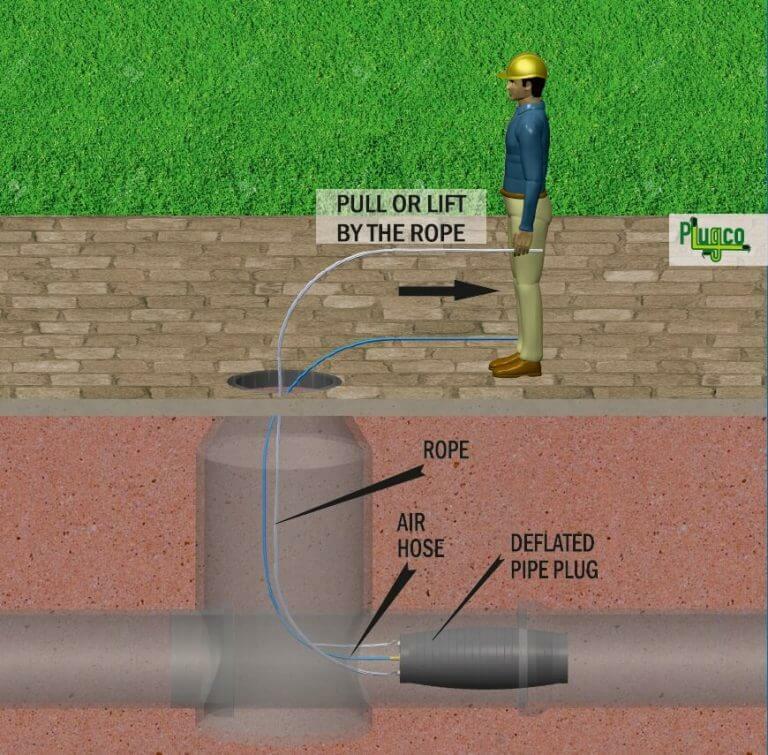 [1.3]Follow and use proper confined space safety rules and equipment during installation and operation of the plug. [1.4]Follow all applicable safety rules of international and local authorities. [1.5]Use all required safety equipment including safety glasses, hard hat, hearing protection, protective footwear and all other necessary protective clothing and equipment. Safety equipment and clothing required will depend upon the environment in which the product is used. 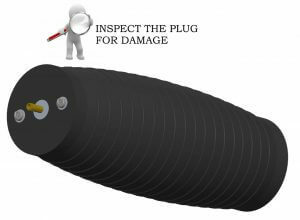 [1.6]Carefully inspect the plug and all related equipment for damage and indications of wear or deterioration before and after each use. The plug may be inflated slightly to aid in the inspection process. After inflation, apply a solution of water and detergent to the equipment or submerge the product completely under water to help locate leaks. Bubbles will form at the site of any air leakage. [1.7]Check the pressure gauge and control device for damage and leakage. 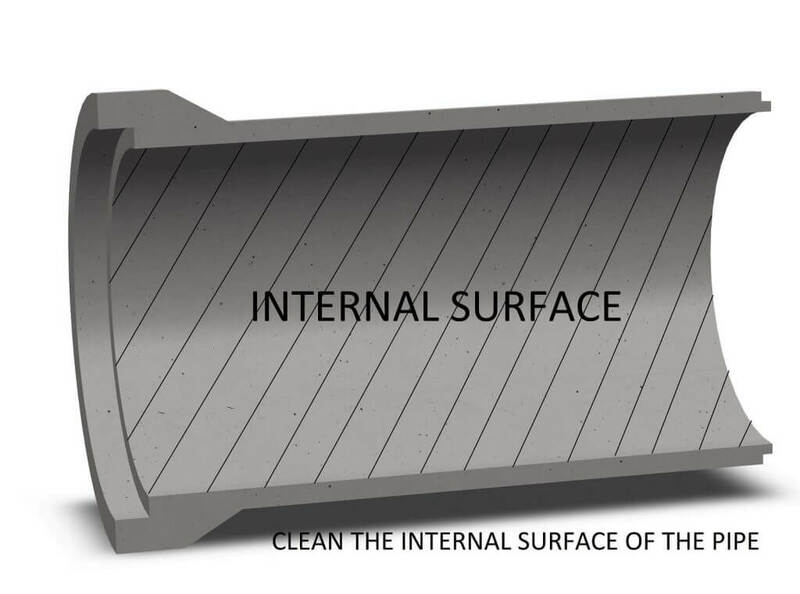 Be sure that there is no air leakage at joints and connections. Always use a calibrated pressure gauge (Figure 1). 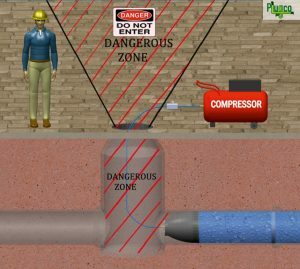 [1.8]Connect an extension hose to the plug, so it can be inflated and deflated from outside the danger zone. [1.9]Do not use an air source (compressor) that does not have a pressure gauge. 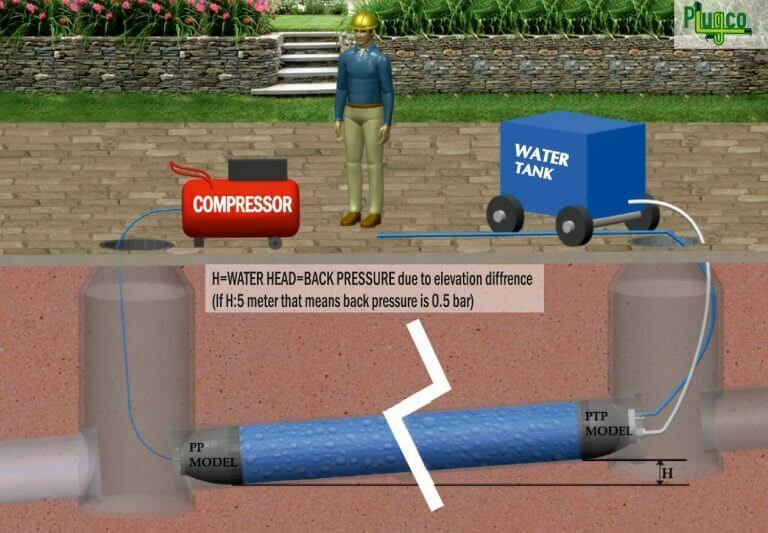 [1.10]Inspect the air hose and water hose (for PTP model) for leakage. 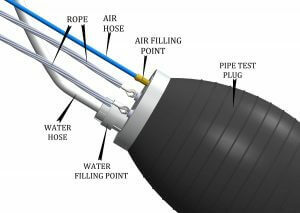 Check the connection points of both hoses for leakage (Figures 2-3). 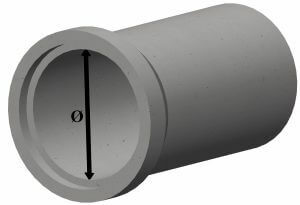 [1.11]Measure the internal pipe diameter and choose the pipe plug size according to the internal pipe diameter (Figure 4). Never use a plug different in diameter than that recommended by PlugCo. 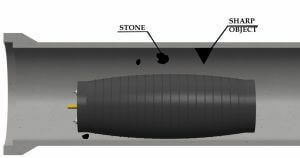 [1.12]Clean the external surface of the plug and internal surface of the pipe to remove stones, protrusions, and any other material from the location where the plug is to be positioned in the piping (Figure 7 and 8). WARNING!! NEVER Clean the plug with solvents, hydrocarbons or other aggressive agents; the plug can be damaged. CAUTION!! Failure to remove dirt, stones or sharp objects in the pipeline can cause poor sealing and damage to the pipe plug. [1.13]Position the plug in the pipeline. 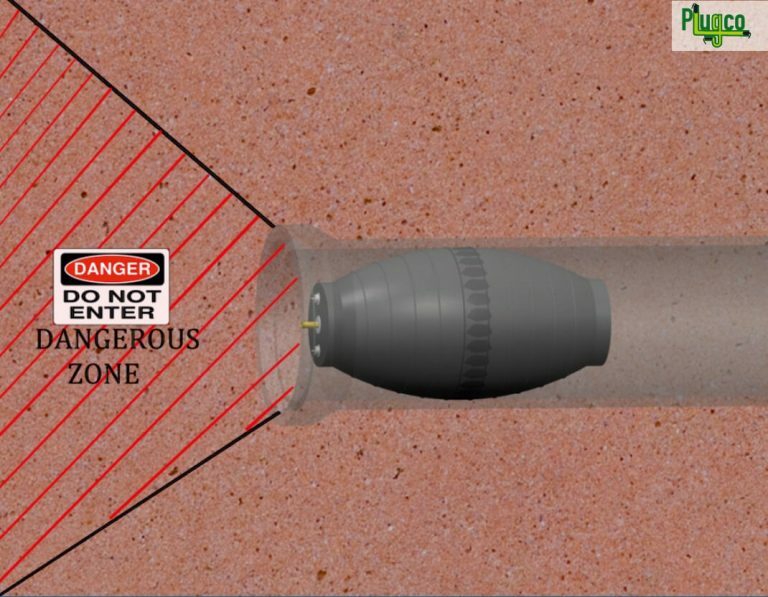 Use a Kevlar or other protective sleeve to protect the plug if there is debris which cannot be removed from the pipeline. [1.15]Insert the plug seal surface completely so it is fully supported by the pipeline. [2.1]Always read the information tag on the plug (Figure 11). If any value does not suit the site conditions DO NOT USE OR OPERATE the plug. [2.2]Stop the pipeline flow before installing any type of plug. 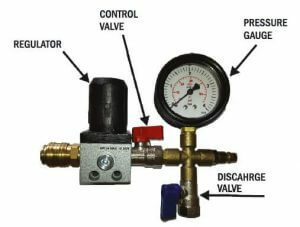 [2.3]Use a bleeding type pressure regulator and a relief valve to maintain the correct pressure with changing temperature and head pressure. 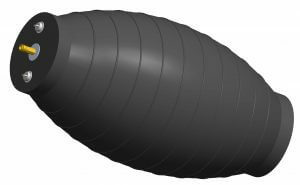 A relieving style pressure regulator and/or pressure relief valve must compensate for these factors and prevent over-inflation that could rupture the plug. 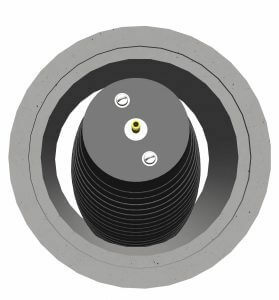 [2.5]Do not exceed the maximum allowable back pressure (Figure 16-17), as outlined in the PlugCo Catalog and on the technical information tag on the pipe plug (Figure 11). 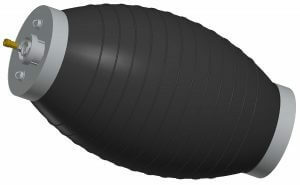 [2.6]PlugCo recommends that water should be used for inflating the plug for model PP5001000 and larger sizes. 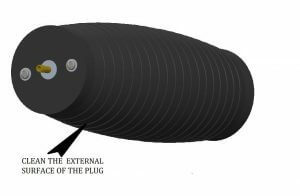 As a minimum the deflated size of the plug should be filled with water. [2.7]Always provide support or bracing to prevent sliding or other movement of the plug whenever back pressure is present (Figure 12 ). [2.8]Stay clear of the plug when under pressure. Do not enter the Danger Zone area when the plug is in use (Figure 13). CAUTION!!! Never enter the Danger Zone. Serious injuries or death may result. [2.9]Do not stand in front of, to the side of or above a plug when in use. [2.10]Never remove the inflation hose until all back pressure is released and the plug is deflated. 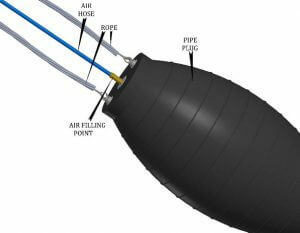 [2.11]Release the back pressure from the pipe first before deflating the pressure in the plug. 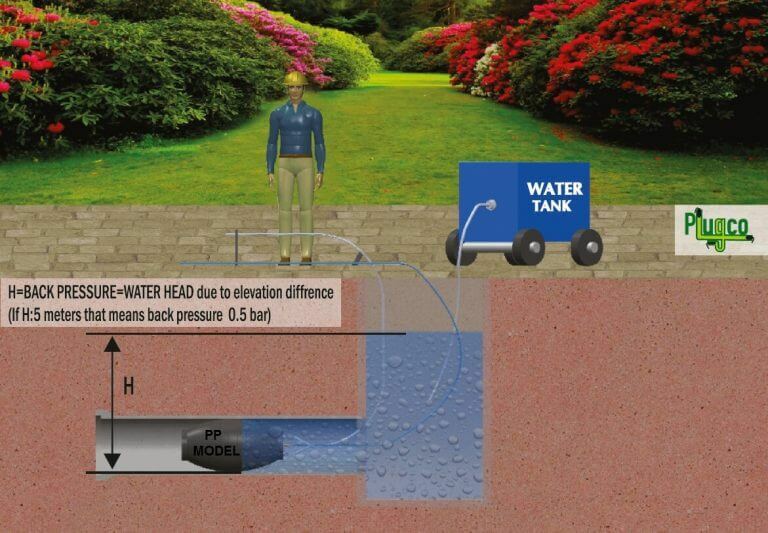 [2.12]Do not lift or pull the plug by the air or water hose (Figure 14). Attach a rope or chain to the lifting brace intended for moving or hoisting the plug (Figure 15). 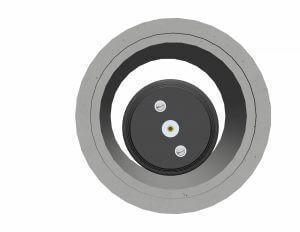 The pressure which pushes against the plug and may cause sliding or other movement (Figures 16-17).